Seville (Spain) – April 11, 2019 (travelindex.com) – H.E. 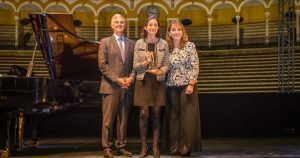 Mari?a Reyes Maroto Illera, Minister of Tourism, Government of Spain, has been awarded a World Travel & Tourism Council (WTTC) Global Champion Award for her country’s work on promoting innovation and technology in tourism. The government of Spain, under Minister Reyes Maroto Illera, is providing global leadership by prioritising innovation in the tourism sector. The efforts made by the Sociedad Mercantil Estatal para la Gestio?n de la Innovacio?n y las Tecnologi?as Turi?sticas (SEGITTUR) to promote research and development for innovation and new technologies in the tourism sector have helped to position Spain as a world-class tourism destination and have led to SEGITUR being recognised as an effective model of national leadership and coordination. Gloria Guevara, President & CEO, WTTC commented, “The Government of Spain provides a leading example of how the power Travel & Tourism to drive economic growth and job creation. Our sector now contributes one in every seven Euros in the Spanish economy and almost 15% of all employment. This success story has been the result of a concerted tourism development strategy by the Government and the Ministry of Tourism under the leadership of H.E. Mari?a Reyes Maroto Illera.